The chief minister-designate and the two deputy chief ministers are, incidentally, not members of the state legislature. Lucknow: In a surprise move, the BJP on Saturday announced that Gorakhpur’s controversial MP Yogi Adityanath would be the next chief minister of Uttar Pradesh. 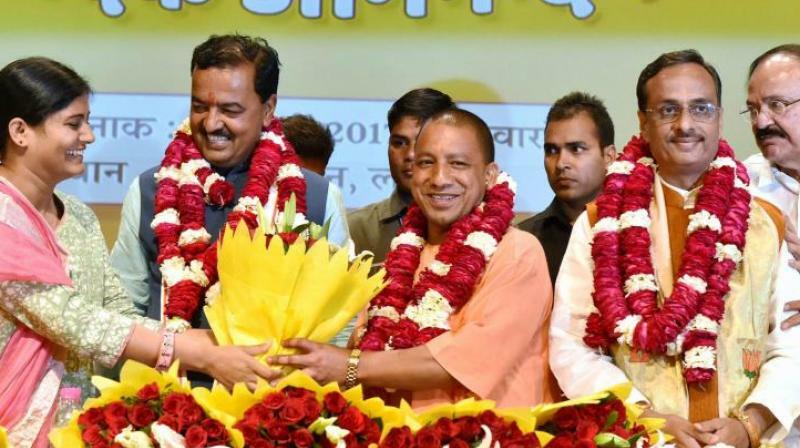 The state will also have two deputy chief ministers — UP BJP chief Keshav Prasad Maurya and Lucknow mayor Dinesh Sharma. The chief minister-designate and the two deputy chief ministers are, incidentally, not members of the state legislature. Yogi Aditynath and Keshav Maurya are MPs, while Dinesh Sharma is not a member of either Houses of the state legislature. After his election, Yogi Adityanath along with his senior colleagues from the BJP went to Raj Bhavan to officially stake claim. Governor Ram Naik has invited him to form the government. The chief minister and his Cabinet will be sworn in at a grand ceremony in Lucknow on Sunday. Prime Minister Narendra Modi and BJP president Amit Shah are expected to be present at the swearing-in. A Thakur and a five-time MP from Gorakhpur, Yogi Adityanath’s name was declared by Union minister Venkaiah Naidu, one of the two central observers at the first BJP legislature party meeting held in the newly-constructed chief minister’s office known as ‘Lok Bhavan’. His name was proposed by Suresh Khanna, an eight-term MLA and was unanimously accepted by the MLAs amidst chants of “Jai Shri Ram”. The election of Yogi Adityanath was preceded by high drama. Yogi Adityanath was summoned to Delhi by a chartered flight on Saturday morning. After meeting Mr Shah, he returned to Lucknow along with Mr Maurya on Saturday afternoon. The legislature party meeting was also delayed by over an hour as Mr Naidu held a closed-door meeting with Mr Maurya, party general secretary Bhupendra Yadav, Yogi Adityanath and senior BJP leader Om Mathur at the VVIP guest house. The presence of Yogi Adityanath at the meeting triggered off speculations since his presence as an MP was unwarranted. The presence of Union minister Anupriya Patel at the meeting was equally surprising. Thousands of his supporters, who had started coming to Lucknow as soon as Yogi Adityanath left for Delhi, thronged the Lok Bhavan gates chanting, “Yogi Yogi”. The supporters became restive as the meeting continued and many of them tried to scale the high iron gates. As soon as news of him being appointed chief minister trickled out, his supporters danced with joy and burst crackers. His supporters had been demanding that he be named CM even before the results were announced. Posters depicting him as Lord Krishna and Ram has surfaced in the state. The 45-year-old leader’s name is believed to have been finalised keeping in mind his immense popularity in eastern UP. Massive preparations have begun for the swearing in ceremony of the new chief minister Yogi Adityanath and his council of ministers. The swearing-in ceremony will take place at 2.15 p. on Sunday and Prime Minister Narendra Modi and BJP president Amit Shah will be present. Talking to reporters, union minister Venkaiah Naidu said that several Chief Ministers of BJP and NDA, including that of Jammu and Kashmir’s Mehbooba Mufti were likely to attend the event. More than one lakh people are expected to gather on Sunday afternoon at Smriti Upvan in Aashiana when the 21st Chief Minister of the most populous state takes oath. Union ministers led by Mr Rajnath Singh and all the 73 BJP MPs from Uttar Pradesh will also attend the swearing-in ceremony. A special eight feet tall platform has been erected at the Smriti Upvan. The main dais is 52 feet long and 24 feet wide. A parallel dais that is 40 feet long and 20 feet wide has also been set up for the newly elected MLAs. All visitors and party workers will be welcomed with a shower of flower petals and a ‘tilak’ by the party's city unit. Boxes of laddoos will also be given to the guests. Over 7,000 security personnel including 18 companies of central forces will be deployed. Seven SPs from adjoining districts and 50 deputy SPs, along with 550 inspectors, will be in charge of security arrangements at the venue. The BJP has the highest stakes for the 2019 general elections and Yogi’s image as a Hindu hardliner will keep the votes polarised on religious lines. With two deputy CMs, the BJP has also tried to strike a caste balance in Uttar Pradesh. After its thrust on OBCs during the elections, the BJP leadership has tried to placate the upper castes with a Thakur Chief Minister, a Brahmin and an OBC deputy chief minister. ■From head priest to UP: Who is Yogi Adityanath?